A convenient way to store it is by using the common practice of freezing it in ice cube trays then popping the cubes into a freezer bag. Then you can pull out what you need without having to thaw an excess amount. At Thanksgiving time, I buy an extra turkey that’s small in size and make my stock a couple of days ahead of time, using an 8 qt. stock pot. My finished stock goes into the stuffing and gravy. 1. 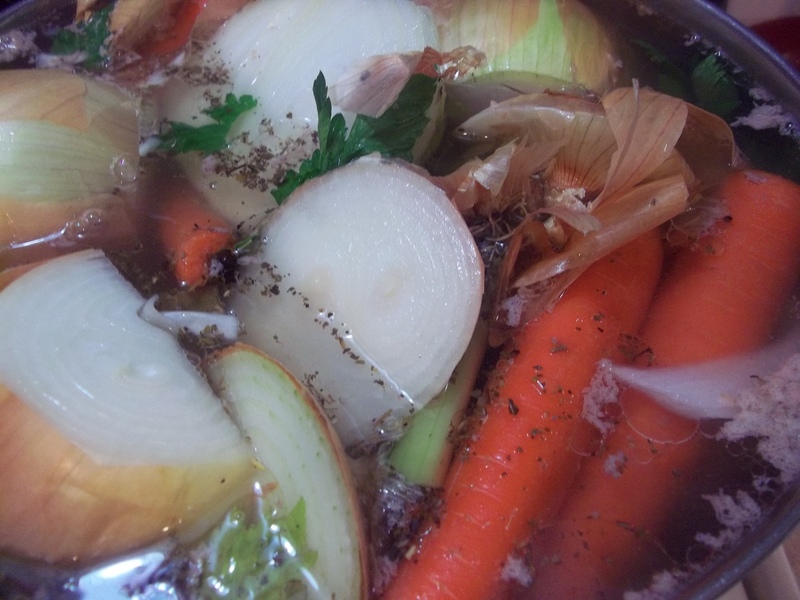 Use cold water, not hot, to start your stock. 2. Do not stir a stock while it is cooking. 3. Never cover a pot of stock while it is cooking. 4. Skim the congealed foam from the surface of the stock as it rises to the top. 5. Never boil stock as it cooks. 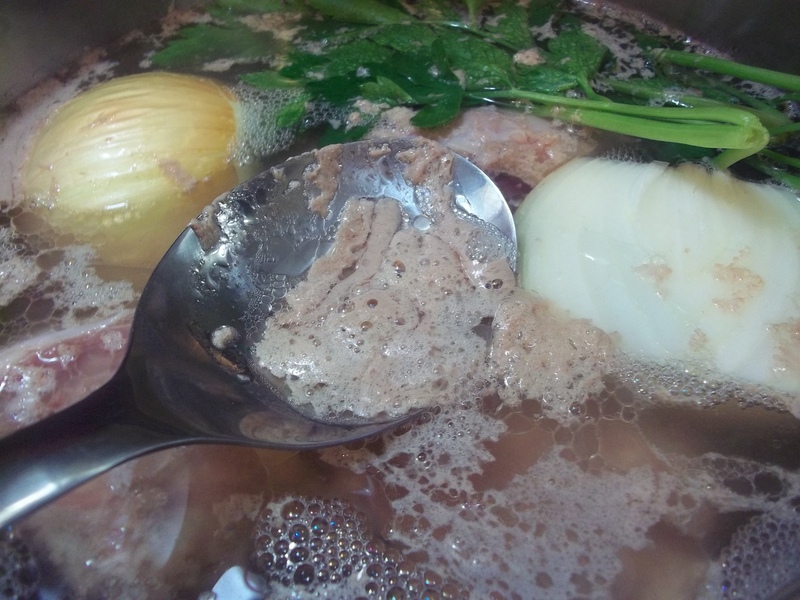 There are also 4 basic components to making a meat stock. 2. Bones with or without meat. When making beef or lamb stock, a richer flavor is achieved if the bones being used are roasted in a hot oven until browned. 3. 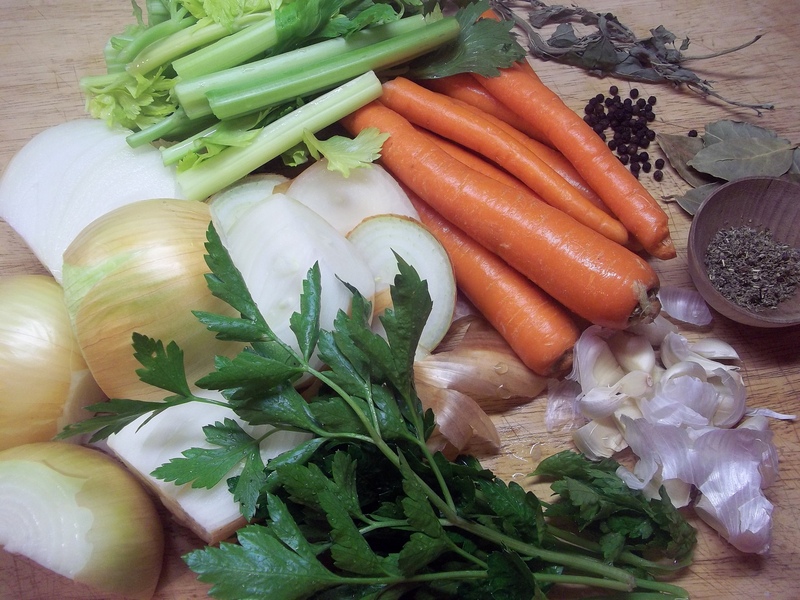 Mirepoix- carrots, onions, celery. The ratio is: 1/2 of the mirepoix should be onions, 1/4 should be celery, 1/4 carrots. 4. Bouquet Garni– herbs and spices used to flavor the stock. Note: A stock never contains salt. Salted stock is called broth. Onion skins give poultry stocks a yellow hue. Poultry stocks need to cook for at least 4 hours. Beef and lamb stocks require 8 or more hours to achieve the greatest flavor. Fish and shellfish stocks can be used within 3o minutes. Vegetable stocks have more flavor if the vegetables are roasted before being used to make stock. 1. 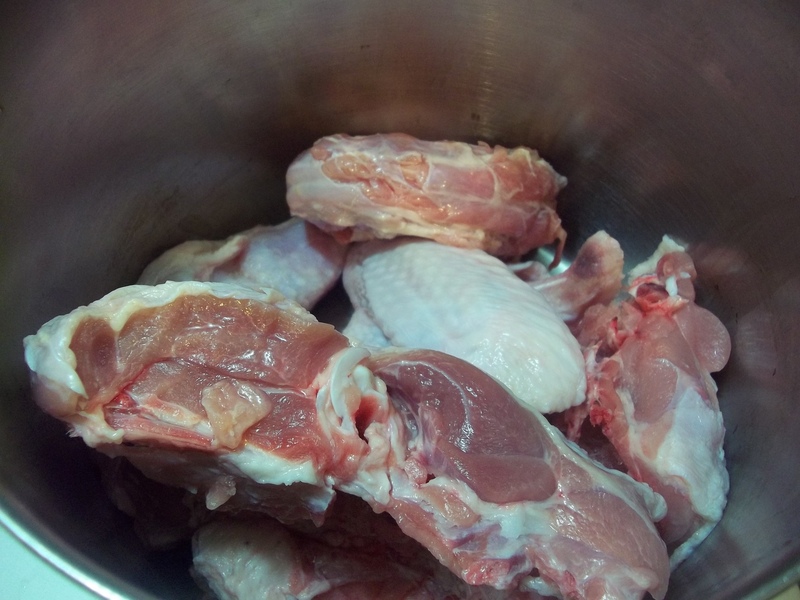 I fill half of my pot with bones and meat when making poultry stocks. 2. Cold water follows. I typically fill my stock pot over the meat and bones to within 3 or 4 inches of the top of the pot. 3. I place in my bouquet garni. If you like you can make a sachet with the herbs and spices using cheesecloth, but I just put them right in and strain the whole batch of stock at the end of the cooking time. 5. Heat the water just until you begin to see movement. Reduce the heat until very little or no movement is noticeable. I basically poach my stock ingredients. 6. Skim off the “scum” from the surface of the liquid as the stock begins to cook. This foamy substance is made of congealed blood, albumin, and impurities that will make the finished stock cloudy if it’s allowed to remain. The scum will rise over a period of time. 7. Allow the ingredients to “steep” like a big batch of tea for the hours recommended for the type of stock being made. Turkey legs, wings, back bones, etc. Fabulous photos – Great colours.